Defence budget constraints across all NATO ­nations point to an overall reduction in defence capability. This article examines ways in which NATO Air Power could overcome this challenge. While the fight against DAESH1 is conducted through a ‘Coalition of the Willing’, there are no ongoing large-scale NATO-led operations. Additionally, though the exact outcome of the Ukraine crisis is still unknown, the recent temporary increase of Air Policing along the eastern borders of the Alliance was not planned, at least not initially, to become a long lasting endeavour. This implies that the Organization will transform from a wartime, combat posture, towards an era in which education, training, and exercise will probably be the main focus in maintaining NATO’s military preparedness and readiness for the coming years. While geopolitical threats are shifting fast, most ­military budgets remain restricted by post-recession austerity policies. The global economic crisis has put pressure on national budgets and consequently ­restricted defence spending. One implication of this is that political decision-makers are re-focusing spending only on essential core business activities within each national department whilst minimizing budget allocation for so-called ‘non-essential’ domains of activity. The overall availability of military capabilities within NATO nations will almost certainly be affected between now and the medium term. This may mean that some specific capabilities may no longer be available for operations or only available for a shorter duration. As clearly explained in the JAPCC Future Vector Project, few nations focus on a broad spectrum of ­capabilities, with most NATO members tending to ­focus on capability developments based on a strategy of capability oriented planning. This leads to a tailored set of defence capabilities and competencies, which implies that interdependencies between nations exist and will continue to exist. In order to be successful in addressing future crises and conflicts, NATO should, therefore, require a guaranteed ‘commitment to deliver’ by its member nations, which will reinforce the will to provide the necessary core competencies. So far however, a guaranteed ‘commitment to deliver’ is far from being politically feasible. Consequently, one can question whether NATO member states will be able to retain appropriate military capabilities and properly train sufficient personnel to assign to NATO in the future. Nobody can really predict the future, except to say it will remain uncertain. Typically, the emergence of supra­national terrorist organizations will drastically ­increase the complexity of the task assigned to traditional armed forces of neutralizing them. We can also expect the nature of conflict to continue to change because of technology. As people become more connected and dependent on technology, the potential for inflicting significant harm on an adversary without the need for violence is likely to increase. Globa­lization is likely to provide opportunities for actors to create ­social and political instability. Future scenarios may present so-called ‘hybrid warfare’ challenges, in which the lines between various types of conflict may be blurred, with a mix of traditional and irregular war, terrorism, and a greater ­emphasis on the battle over the narrative. This kind of scenario would further require organizations like NATO to place the emphasis on a so-called comprehensive approach through in-depth cooperation and coordination with non-military organizations. As the nature of future conflict is hard to predict, a complete set of Air Power capabilities in the fields of Combat and Combat Support will need to be maintained. Continuous training for the full spectrum of air warfare remains our unique guarantee that Air Power will remain relevant and able to face any kind of crisis. NATO may need to plan and prepare managing fewer available resources but with no foreseeable reduction in actual demand. In June 2014, the NATO Secretary General, Anders ­Fogh Rasmussen, declared that ‘Russia’s illegal aggression against Ukraine has made the security environment in Europe unpredictable and dangerous. Russia has increased defence spending by fifty percent over the last five years, while the allies have reduced theirs by a fifth.’ Rasmussen warned NATO members that they will have to pay for measures that must be con­tinued ‘as long as necessary’.3 He asked nations to ­further increase their spending when the economic situation would permit.4 However, whilst this might convince some NATO member nations to freeze defence budgets until the situation in Ukraine is stabil­ized, the current economic situation may drive them to maintain additional budget reductions in their medium term agenda. Only a small group of NATO nations have effectively committed themselves to meeting the 2 % of GDP level for defence spending, as was reiterated during last year’s NATO Summit in Wales. Whilst the American economy has recovered from the 2008 crisis, the consequences of the sequestration pro­cess could strongly influence the shaping of US forces during the next decade. Consequently, one of the main changes is the shift from a ‘Win-Win’ towards a ‘Win-Deny’ strategy for US Defence forces, to include an increased reliance on European armed forces to cover the gap induced by the decrease in US cap­ability poten­tial. A greater role for European Air Power may be required and European nations should be prepared for this. When faced with the same requirements but dimin­ishing resources, there is an increased need for both the US and Europe to jointly consider how best to ­address these potential shortfalls whilst searching for possible synergies. Synergy implies that the result of the combined effect should be greater than the result of two separate ­actions. Another possible understanding of this defin­ition could be the use of fewer resources in a more ­effective and cooperative way should lead to the same goal. In military terms, a synergistic ­approach could mean that NATO Air Power might be able to fulfil its assigned tasks with reduced assigned capabilities if it operates in a different, perhaps more efficient way. Without doubt, further increased efficiency in the ways of using available resources will be required. ­Prioritization, cooperation and effectiveness will become key throughout the entire equipment lifecycle, from the start of the acquisition phase until the end of their effective use in operation. This should start in the acquisition phase, during which managers must ask themselves whether synergies may be found between services or within the same service. Subsequently, even though it may require additional efforts to overcome potential national reservations or to address ­legal issues, exploring multinational cooperation must be considered as a potential source of synergies resulting from larger scale acquisitions. Finding synergies with internal or external partners in order to reduce costs must become an integral part of every programme. This may require clear directives to set-up the correct priorities and to overcome the ‘corporatism’ or other cultural barriers that are sometimes encountered in large organizations. Operational planning. Even though this may already be the case, operational managers must continue to look for synergies and decide upon the most optimal use of their assigned capabilities. As we may anticipate some reductions in terms of capabilities, operational planners must look further into ways of maximizing and optimizing the use of the available resources. This may take place in two ways: firstly, a better knowledge of the real potential for cooperative use of assets, and, secondly, optimizing effects-based targeting with a careful choice of the assigned capabilities. The result of this should be improved selection of the capability best-suited to achieve the assigned objective. Increased pressure on operational planners will inevitably push them towards looking for the ‘best pay-off’ for every situation. This is likely to require an increased effort in education and training. From multi-role to multi-mission. This emerging con­cept makes it possible to achieve synergy through the simultaneous use of a single platform for multiple missions where previously two or more platforms would have been required. Some such initiatives already exist. However, the degree of influence of one role on another role’s performance implies that it may not be considered as a true multi-mission platform. In the domain of Air Combat, 5th generation and ­future upgraded versions of so-called ‘4.5 generation’ aircraft are claimed to be designed to allow them to conduct a variety of missions simultaneously in a contested environment. Similarly, Defence industry must conceptualize and develop future platforms, manned and unmanned, to become truly ‘multi-mission’. The potential exists to develop future Remotely Piloted Aircraft Systems (RPAS) that are able to conduct multiple missions during the same sortie. Any combination including two or more of the Imagery, Surveillance and Reconaissance (ISR), Electronic Warfare (EW), Transport or Air-to-Air Refuelling (AAR) roles should provide future Air Operations Commanders with increased flex­ibility whilst also capitalizing on the persistence offered by unmanned platforms. Multinational construct. The NATO E3-A ­Component, the C-17 Heavy Airlift Wing and the NATO Alliance Ground Surveillance (AGS) are examples of efficient multinational constructs. The E3-A and the Heavy Airlift Wing proved their cost-effectiveness by allowing nations to pool resources in order to provide NATO with an appropriate solution to mitigate a capability gap. Today, as the cost of high-tech assets is increasing at a higher rate than inflation and as defence budgets are decreasing, the only option nations have is to buy less equipment or refrain from buying ­al­together. Since some nations are now struggling to find the financial resources needed to replace legacy equipment, the creation of such multinational units should be seen as one of the possible ways ahead. One might argue that issues of responsibility and sover­eignty may hamper such a concept when it comes to fielding multinational units in the Air Combat Operations arena. However, it is surprising what can be achieved once the political will exists. Training scenarios. NATO training scenarios also need to acknowledge the lack of capabilities. At the leadership level, NATO must train in circumstances where judgment and risk assessment will become key to providing planners with proper direction. The use of simulation training capacities should increase the overall quality of training. The mantra of ‘train hard to fight easy’ should perhaps be replaced by one of ‘train hard, then train harder’. A reduction in defence spending will always be an ‘easy win’ for politicians looking for ways to make ­savings. Resources, including financial ones, are finite and compromises will continue to be required. ‘Fight like you train’ will remain even more valid ­tomorrow than it has during recent decades. In order to assure the success of future operations, all NATO personnel involved in operational planning must concern themselves with maximizing the output of oper­ational capabilities. Key to any success will be ad­equate training in challenging scenarios where the overall avail­ability of operational resources may not meet the anticipated requirements. Ensuring high quality training for its personnel will help NATO to maintain the ability to cope with future peer competi­tors and to cover a broader spectrum of tasks whilst anticipating a lack of resources. However, a war cannot be won without adequate ­material and military spending cannot be cut indefin­itely. Nations, who are the owners of most of NATO’s inventory, will play a key role when it comes to selecting and introducing new capabilities into service. ‘Multi-mission’ and ‘Multinational’ may become the only way to overcome the budgetary constraints that nations will continue to face in the years to come. Sovereignty and liability issues may prove difficult to overcome when it comes to establishing the concept of multinational combat units. Nevertheless, this should be considered at the political level as one potential solution to overcome reduced resources. This will, no doubt, require political willingness amongst pioneer nations and a top-down approach. 1. ‘ad-Dawlah al-Islāmīyah fī al-’Irāq wash-Shām’, the Militant group which Identifies itself as the Islamic State (IS). 2. DCDC, ‘The Future Character of Conflict’, https://www.gov.uk/government/uploads/system/uploads/attachment_data/file/33685/FCOCReadactedFinalWeb.pdf, p. 38. 3. ‘Russia, friend or foe for NATO?’, BRUSSELS, 5 Jun., 2014 (AFP), http://www.defencetalk.com/russia-friend-or-foe-for-nato-59771. 4. ‘The Future of NATO: A Strong Alliance in an Unpredictable World’, Anders Fogh Rasmussen, 19 Jun. 2014, http://www.chathamhouse.org/sites/files/chathamhouse/field/field_document/20140619Rasmussen.pdf. is an experienced Air Operations Officer currently assigned to the JAPCC in the Combat Air Branch as a Combat aircraft SME. Lieutenant Colonel Gremez is a fighter pilot of the Belgian Air Force with almost 2,000 hours on the F-16. 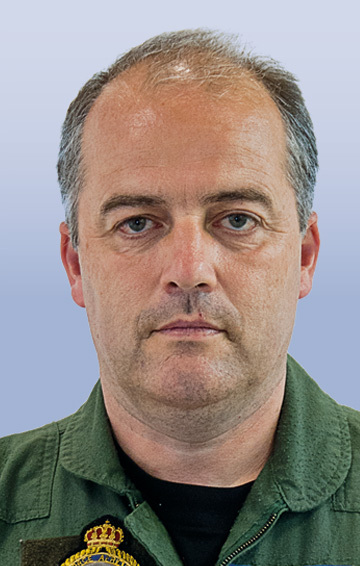 His previous assignments include the 2 Tactical Wing (FLORENNES AB) as Flying Group Commander, the Staff of the Belgian Air Component Command and the Belgian Defence College.